The release sytem NOV-1 consists of the release panel Art.No. H01.030 and the optional remote release box Art. No. RP02.002. 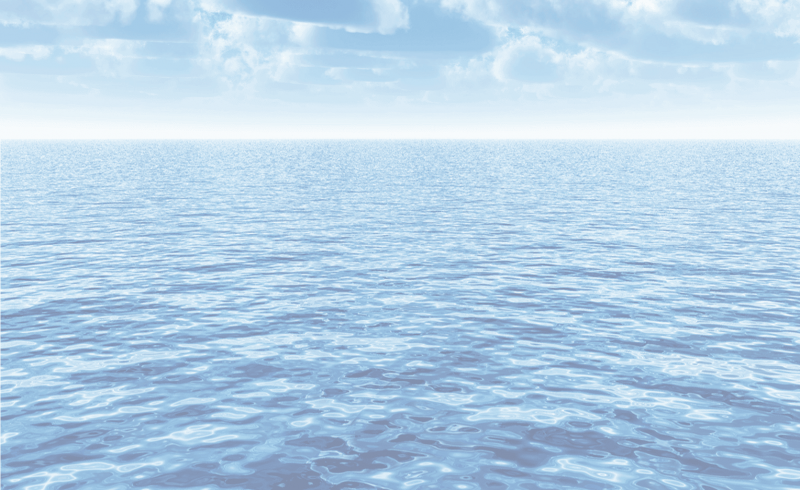 This system releases gases other than CO2 like e.g. NOVEC 1230 (made by 3M), FM-200 (made by DuPont) or similar. It is designed to safeguard a single section. After initiating a release the sequence of pre-alarm, time delay and gas discharge is electronically controlled and automatised. A release sequence can be stopped anytime within the delay time. All electrical lines and the pressures of the extinction gas cylinders are monitored. The system is supplied by two power sources, each of them powers one independent discharge circuit encompassing each extinction agent cylinder. The system NOV-1 is built according the rules of the international code for fire safety systems (FSS Code), Chapter 5, including the adoptions of amendmends of resolution MSC.339(91). It is built with components from the safetec ACS-1 series of fire detection - and fighting systems. The release unit H01.030 is intended for electrical initiated fire extinction using modern extinguishing agents like NOVECTM 1230 or FM200® for one extinguishing section. Each container has its own magnetic actuator, connected via junction box JB05.001. Release takes place via 2 redundant monitored lines with up to 6A release current. 2 independently working power supply units are installed. Remote release units of the type RP02.002 can be connected. 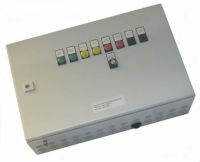 The state of the power supply and of the extinguishing gas pressure, the release alarm and a common fault signal are indicated by optical indicators. These informations are also forwarded to ship´s monitor- and alarm systems by potentialfree contacts. 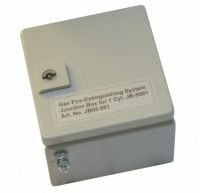 The junction box JB05.001 complements the electrical gas release panel NOV-1. It provides a secure connection of the release panel to the electromagnetic release valves and the pressure switches via two spatial and electrical separated release loops. 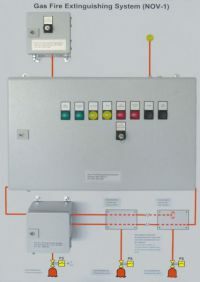 Each combination of valve and pressure switch is connected to it`s own junction box. The two release loops are decoupled by heat resistant diodes. A self resetting fuse (polymer PTC) protects the system against short circuit in an electromagnetic release valve or it`s connection cable. A a release current of 500 mA per valve up to 12 junction boxes can be connected to one NOV-1. 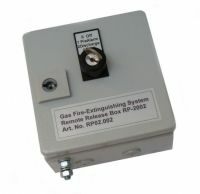 The remote release panel RP-2001 allows start and stop of a extinguishing process from a safe location. Turning the key switch to “1” starts the pre- alarm and the time delay. This is indicated by an indicator lamp and an acoustical signal at the release unit H01.030. Is the key switch turned to “2”, the actuators of the extinguishing gas containers are activated after the expiration of the time delay. This position of the switch can be chosen at once, in either case the gaseous agent is only discharged after the expiration of the time delay. Resetting the switch to “0” before the end of the time delay terminates the extinguishing process. This download-area provides manuals for NOV-1. The download-links will appear after log-in.